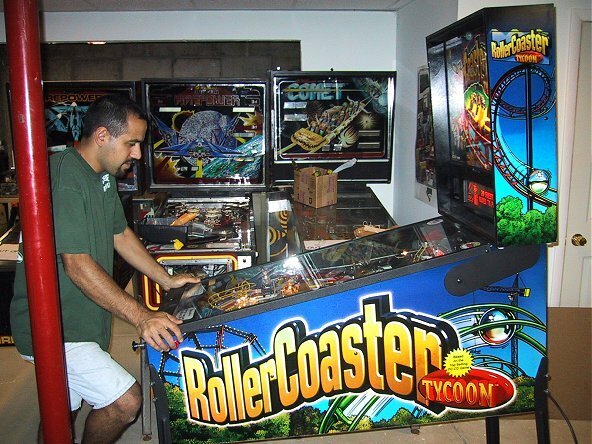 Roller Coaster Tycoon went into production in early August of 2002. It is the second game designed for Stern by former Williams designer Pat Lawlor, the first being the 2001 release of Monopoly. My Machine is serial number 165888, manufactured on August 29, 2002. Update - Well, it turns out RCT wasn't the killer Pat Lawlor game I thought it would be. The "troll" voice got very grating after a few games, and I really wanted to take his "hit me!" chant and take a sledge hammer to him. I sold the game in October of 2003 to somebody who hopefully has worse hearing than I do. Once again, I went out on the proverbial limb and bought a pinball machine that I hadn't seen or played. 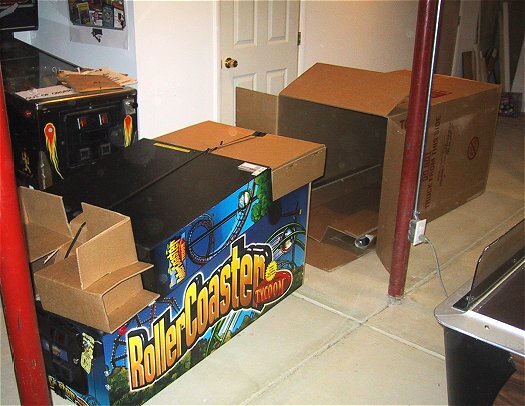 Based on the positive reports of the prototype game in the Chicago suburbs as reported on rec.games.pinball and the sample games delivered to England, I once again plunked down my money sight unseen. With Monopoly it was because I thought this might be my last chance to get a NIB machine, not knowing if Stern was going to make in one more year. They seem to have thrived last year and this year due to the success of Monopoly (and people like me who bought them NIB!) and I think they'll be around for at least a few more years. Loving Monopoly as much as I do, this was a "no brainer", and from the first few games, it looks like RCT is as good, if not better, than Monopoly. 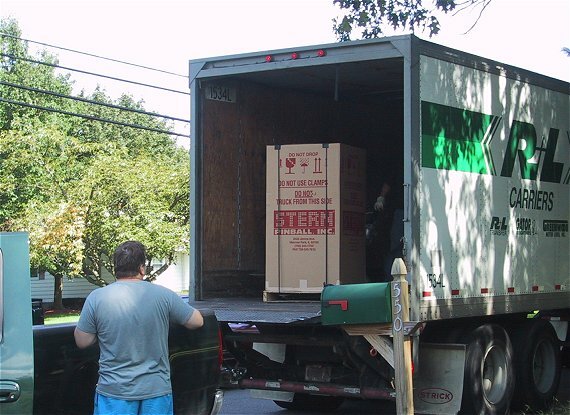 Deja vue all over again... Just as with Monopoly, the truck stopped out in the street and we transferred the box from the truck into my pickup for the final 300' ride down the driveway. This time at least, it was shipped on a pallet, Monopoly was just the box. There's nothing like the "New In Box" experience! Sliding the game out for the first time is quite a rush. helped me get the game into the basement! Being a software designer by profession, I am usually on the receiving end of bug complaints. Most are the result of a progression of events, ie "I clicked here, canceled this, then went here and it didn't look right". 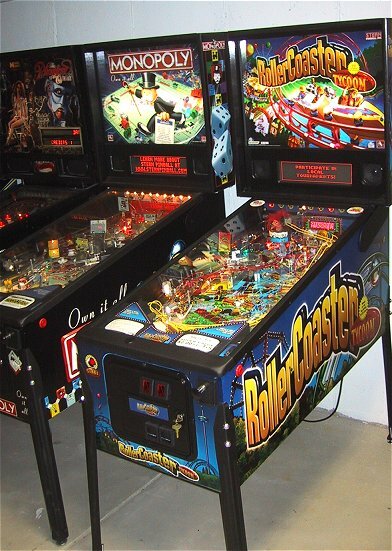 Pinball software is no exception, and when Tony and I were playing our first game, I got the ball down the yellow ramp and it was deposited in the left lock lane, and lo and behold, the game went to end of ball! Hmmm, that's interesting, hit the ramp shot and loose your turn... Then when Tony as player two locked a ball, he got two balls deposited in the shooter lane... Got to be a stuck or bad switch we figured. Switch test showed no problems, but then we noticed that the upper switch in the lock lane was slow coming back up. Turns out it was rubbing against the other rollover. After removing the switch assembly and realigning it, we put it back in and the game played perfectly. re-create the problem and your post was helpful. 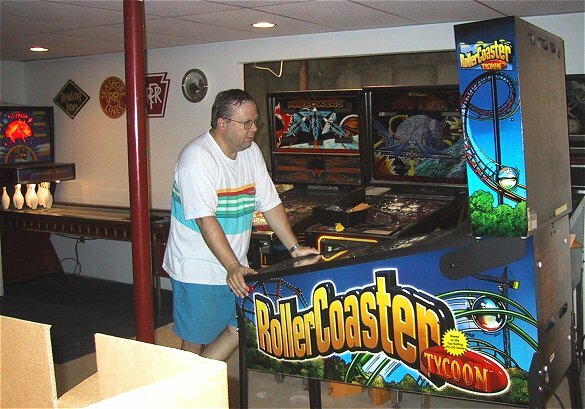 Hope you enjoy Roller Coaster Tycoon. engraved number "23" on it was bouncing around in the cabinet! apologizing for the nut driver being left in the machine. That's great Customer Sevice!